If you are looking for a drive in the country including an atmospheric community market experience, White Hat can thoroughly recommend a visit to St Andrews Market. The journey takes you through the Yarra Valley and associated bushland, and you can take an alternative route home to see even more of the countryside. St. Andrews Market offers good quality (mainly organic) produce at competitive prices and there are also a number of prepared food stalls which offers wholesome food at good prices. The Thai food stall offers particularly good value. There is a wide range of stalls selling clothing, gifts, cosmetics and other wares with an emphasis on 'alternative' goods. The prices are usually very good and you can often expect to pay about a third less than you would for equivalent goods at a city market. 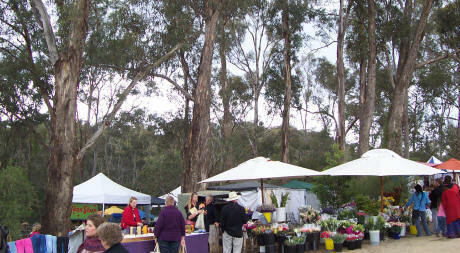 There is a free bus on Saturdays running between Hurstbridge Station and St Andrews Market. The first bus leaves the station at 9.25am and the last bus leaves the market at 5.20pm. It runs every 40 minutes between those times with each one-way trip taking about 20 minutes. There is a twilight market from 4pm to 9pm on a selected Tuesday before Christmas.